The Feria de Pedro Romero in Ronda (Malaga) in Andalusia takes place in the first week of September. Ronda has been linked with bullfighting since 1572 when King Phillip II of Spain established a royal cavalry in the town. The 5-day festival is a great opportunity to see the social and cultural aspects of bullfighting – especially at the Corrida Goyesca. Fights start at 5.30pm each evening. Hemingway – a regular visitor to Ronda – is said to have based a chapter of his book ‘For Whom the Bell Tolls’ on events during the civil war in Ronda. Orson Welles was another visitor – had his ashes buried outside the town on the land of retired bullfighter Antonio Ordoñez. You’ll find plenty to see in the town and closeby, there are a number of excellent olive oil producers and some interesting wineries to sample locally. Ronda is a great stopover between Seville (128km) and Granada (178km). It’s also a good base for touring the white villages and very close to Malaga (100km) which is a great city on the coast where you can visit both the new Thyssen museum and the Picasso Museum in the city. The nearest airport to Ronda is Malaga Airport. See our suggested city package for Malaga for more ideas in the area. On the Sunday that falls in the middle of September, the Rioja Alavesa Wine Harvest Festival begins. Unlike other wine festivals, the location changes from year to year, moving from village to village, which makes it a real community affair. The day begins early with the announcement of the region’s wine competition winners. The first grapes are pressed and a tasting of the first must is held. Musicians, dancers, and local food producers are at hand to provide plenty of atmosphere and activities. At 2pm there is a traditional Rioja Alavesa lunch with wine – of course! The organisers conveniently offer bus transfers from Bilbao and Vitoria to the festival and back on the same day. Ideal for those who don’t have time to stay over and want to enjoy the harvest festival without having to drive afterwards! 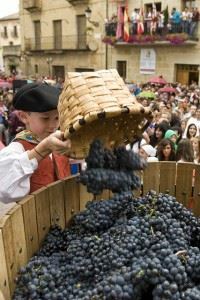 A double fiesta for San Mateo and the Rioja Wine Harvest Festival kicks off on the third week of September in Logroño and runs for one week. On the first day, the patron of La Rioja – the Virgin de Valvanera – is offered the first pressing of the grapes. This is an occasion steeped in tradition and is observed by large crowds. The grapes are squelched in public view by foot by the same two brothers for the past forty odd years. Over the week, you’ll find children and adults dressed in local costume and music filling the streets. The days are packed with events such as bullfights, concerts, food tastings and fireworks. Both festivals are a great reason to visit the wine growing regions of La Rioja & La Rioja Alavesa. It’s an excellent way to sample a huge number of local wines for very little – you pay about 6 euros for a wine glass which comes with tickets to exchange at the many winery stalls. Make a note of the ones you like and check whether the wineries themselves are open for visits after the festival. 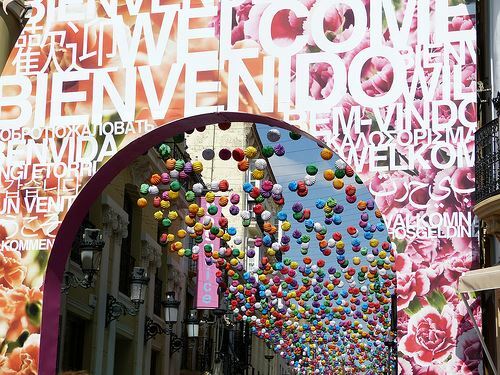 Both festivals are closeby the cities of Bilbao and San Sebastian. [Logroño to Bilbao 137km. Logroño to San Sebastian 167km. Villabuena to Bilbao 106km. Villabuena to San Sebastian 157km. Fly into Bilbao Airport. See our wine tourism and Basque Country suggested tours for more ideas in the area. The San Sebastian International Film Festival takes place on the last week of September. San Sebastian gets extremely busy at festival time and the hotel rates rise accordingly but it’s a unique opportunity to spot the stars in an amazing setting. In addition to the usual premieres, press conferences and glitzy events, since 2010 the festival runs a film and gastronomy section called Culinary Cinema that features seven foodie films. Each screening accompanied by themed dinners prepared by the best Basque chefs. What a brilliant idea! The gourmet capital of Spain boasts some of the world’s top restaurants as well the being home to the most creative tapas bars or pinchos as they are known locally. You’ll enjoy the atmospheric old historic quarter, the belle epoque architecture and the wonderful La Concha beach within the city. Fly into Bilbao (99km) or just over the border into Biarritz France (51km). See our post on San Sebastian in 2016, our San Sebastian city package and our Basque Country suggested tours for more ideas in the area. The Fiesta Mayor de la Merce takes place in Barcelona on the third week of September. Merce is the patron saint of Barcelona who rid the Catalan capital of a plaque in 1687. 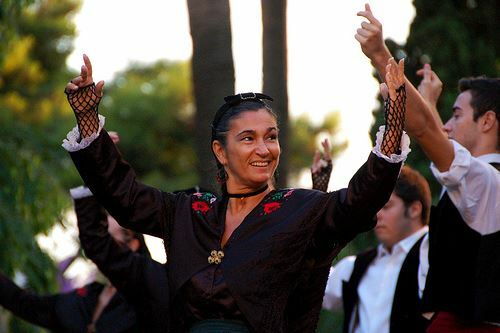 Today the city honours her with four days of traditional dance, processions and street events featuring performers, dancers, castellers, marching bands, musicians plus large scale concerts. The Ramblas, the Sagrada Familia, la Pedrera, the Guell Park, the Gothic Quarter – Barcelona has so many attractions. If you want an interesting day trip, take the train or bus to the Monastery of Monserrat for the stunning mountains and La Morenata or the Black Madonna. See What to See & Do in Barcelona in 48 hours and our Barcelona City package for more ideas in the area. Tarragona is one of Spain’s oldest cities and well-known for its amazing Roman ruins and its wonderful archaeological museum. When you have explored the artifacts, you might like to see the Priorat wine region. Its tiny capital, Falset, is only 42km away from Tarragona. Fly into Reus airport just 11km from Tarragona or Barcelona Airport which is 90km from Tarragona. 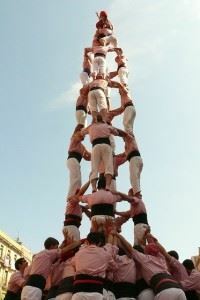 See our Journey through Catalonia package for more ideas in the area. Posted in Andalucia, Barcelona, Basque Country, Bilbao, Catalonia, Entertainment, Festivals, Food & Drink, La Rioja, Popular Posts, Rioja Alavesa, Ronda, San Sebastian, Spain, Wineries and tagged Barcelona, castellers, dance, Feria de Pedro Romero, festivals, Fiesta Mayor de la Merce, fiestas, Fiestas de Santa Tecla, film festival, Hemingway, Malaga, off-peak, Orson Welles, Processions, Rioja, Rioja Alavesa Wine Harvest Festival, Rioja Wine Harvest Festival, Ronda, San Mateo, San Sebastian International Film Festival, September, Spain, Tarragona, wine tourism.